Prasonissi is actually a small peninsula in the summer and a small islet in the winter at the Southern edge of Rhodes island at a distance of about 95 km from Rhodes town. It is connected to the main body of Rhodes by a sandbank about 1000 m long. 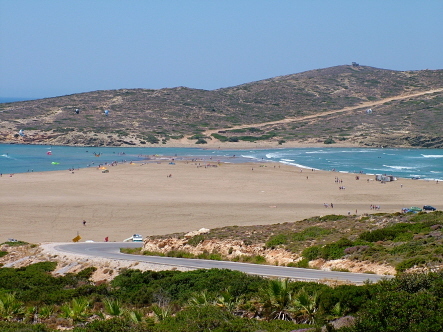 The beach is sandy, crescent stretching of one mile and is a windsurfer enthusiast paradise. Depending on the direction of the wind, the sea on one side of the bank will be rough (usually the right part) and that on the other calm. Beginner or not, Prassonisi is right for you. The right side of the beach offers windsurf equipment to rent. There are some accommodation options of apartments and studios. There are some shops and some good tavernas. Also there is a bus connection to Rhodes town.